In the wonderful way that books speak to each other across continents and centuries, Herland is a novel that feels as if it should be compared. 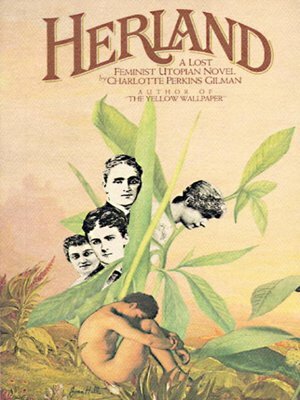 A utopian novel first published serially and then in novel form in 1915, Herland speaks directly to a whole area of literature devoted to considering the possibilities of matriarchy, or the balance of gender power in society. Vandyck Jennings narrates his experiences of adventuring with his two school pals, Terry Nicholson and Jeff Margrave. Terry is rich and also a chauvinist. Jeff is a doctor, who puts women on a pedestal. Vandyck considers himself a man of science and hence of considered reflection and balance. On a large scientific expedition – Vandyck doesn’t reveal where – the three of them hear rumours of a female society cut off from the rest of the world by sheer mountains. They get the guide to show them the red and blue river below the mountain and they discover died cloth, evidence of a society far superior (in their opinion) to that to which the guide belongs. They decide to come back and find this women’s world for themselves. As you can already tell, plenty of old conceptual frameworks remain in place in the novel regardless of its progressive, radical, ideas of what women are capable of. The novel feels like a mix between a science fiction adventure novel – in the style of Jules Verne’s Journey to the Centre of the Earth – and a polemical tract because the strong, capable, nurturing society that the men eventually discover is really there to tell readers how differently our world could be organised. This sometimes makes the storytelling aspect, or the plot of the novel, at least in chronological terms, rather muddied. How the three men move from capture to freedom, marriage and employment isn’t the focus of the novel. Exploring how this matriarchal society, grown through parthenogenesis (asexual reproduction) might work is of central importance. The painless eugenics encountered along the way pales into insignificance when compared to the disease, crime and war of the world of men outside Herland. The one aspect of the novel that I have a great deal of respect for, is its attitude to education. Education is more important than anything else in these women’s drive to move their society forwards. And this education isn’t of the standard schooled kind, but the practical and playful kind that follows first children’s and then adults’ interests, exploring all areas of learning through what motivates the learners. The two most important things that people (not just children) must try to develop are: ‘a clear, far-reaching judgement, and a strong well-used will’. It is an interesting and compelling vision for a world that sees child-rearing and instilling a lifelong love of learning as its most important function. I’d be happy for some of these ideas to be lived out now. And this is where Herland provides an interesting comparison with Naomi Alderman’s The Power. Where Herland easily envisions women without sexual desire – and I wonder if sexual desire is seen by Gilman to be part of the cause of division and criminal traits in our male-dominated world – The Power struggles to incorporate women as mothers. What both novels have in common is an exploration of the fluid nature of gender stereotypes. Despite the gap of time that divides these books, they speak to each other in ways I’ll probably think about more and aim to articulate better. Ultimately Herland is an interesting book. It has strange flaws, due to its polemical heart. The narrative and society all privilege contiguity, as one thing is described so it inspires the telling of the next; in the same way that Herland sees connection between things as the driving force for developing a forward looking society whose individuals work towards the good of the whole. Herland provokes a lot of thought, and despite the sometimes clunky narrative jumps, I am intrigued to find out what happens next in the follow-up novel, With Her in Ourland, which sees the early 20th century through the eyes of Vandyck’s Herland wife (though written up by him). 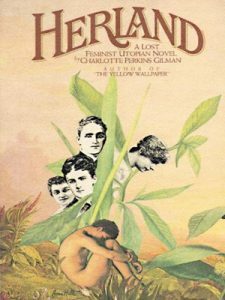 Like The Handmaid’s Tale, there could be a very interesting adaptation made of Herland. I’ll write it, if someone wants it! Next week I’m reading Rain Falls on Everyone by Clár Ní Chonghaile.